Island greens. Long tree-lined fairways. Dog-legs left. Dog-legs right. Abundant wildlife - deer that actually come into play on some holes. The people who love this course play to all levels. They like The Rock because it's an experience, not just a round of golf. Outside Guest-(Weekday) $50 for 18 holes, includes cart. Outside Guest-(Weekend) $55 for 18 holes, includes cart. Resort Guest- (Weekday) $45 for 18 holes, includes cart. Resort Guest- (Weekend) $50 for 18 holes, includes cart. Outside Guest-(Weekday) $59 for 18 holes, includes cart. Outside Guest-(Weekend) $69 for 18 holes, includes cart. Resort Guest- (Weekday) $54 for 18 holes, includes cart. Resort Guest- (Weekend) $64 for 18 holes, includes cart. Outside Guest-(Weekday) $44 for 18 holes, includes cart. Outside Guest-(Weekend) $49 for 18 holes, includes cart. Resort Guest- (Weekday) $42.00 for 18 holes, includes cart. Resort Guest- (Weekend) $47.00 for 18 holes, includes cart. All rates are per person and include shared cart. 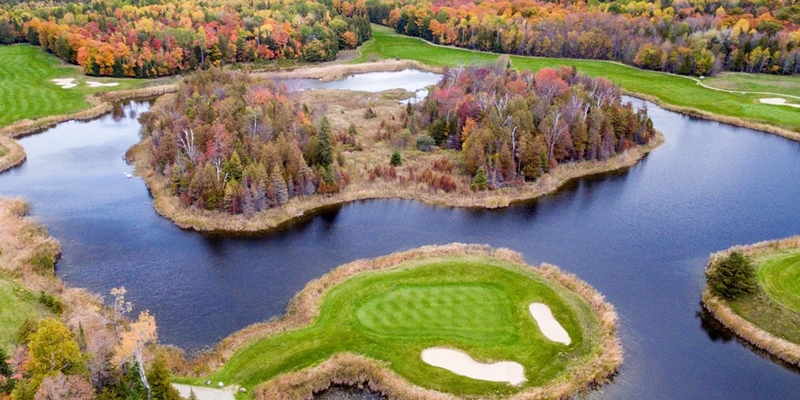 Please call 906-493-1006 to book your tee time. Please arrive 30 minutes before your scheduled tee-time. Please contact Keli Kelly for all you Golf Membership needs. We have both Men's and Women's Leagues. Please call for information. 906-493-1006. Please contact Keli Kelly for a quote for your golf group or outing. the necessary contacts for cakes, flowers, musicians, DJ's & photographers and hair stylists. Allow us to take care of your rehearsal dinner, morning after brunch or other wedding related parties in one of our banquet facilities, restaurants, cottages or on the waterfront. Whether it's an intimate affair or a gala event, we can help to make your wedding fantasy come true. We can also set up a golf outing at our championship 18-hole golf course, The Rock, arrange for a bonfire on the beach or other activity for you and your guests. We pride ourselves on having outstanding service, breathtaking views, unique rustic elegance and numerous amenities and activities. Rustic elegance in a unique, comfortable setting. Each of our executive-style cabins and cottages are entirely unique. With a view of sunsets and the bay, these are proving to be in very high demand. We have several other cottages and log homes available. Most of these 1-5 bedrooms units feature private bathrooms in every bedroom, fireplaces and firewood, full kitchens with coffee makers, comfortable living rooms and grills for that memorable evening barbecue. Special weekly rates are available for all cottages. Our forty-room hotel, "The Lodge" has unique wood construction rooms that feature telephones, televisions with satellite connection and small refrigerators. Our "loft" rooms feature 2 queen beds on the first level and a third queen bed up in the loft (perfect for families and small groups). If you are interested in having us host a special meal, or if you would like more information, please send us an email at thelodge@drummondisland.com or call us at (800) 999-6343. 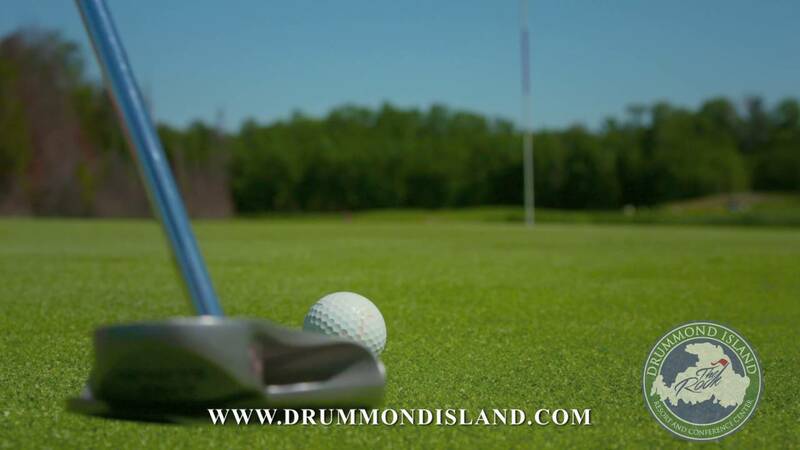 Watch the Drummond Island Resort Video. This profile was last updated on 03/22/2019 and has been viewed 8,737 times.